This is the second RAMPART title, and lead vocalist Maria has been compelled to recruit an all new lineup for the recording of “War Behest”. Infernö Records proudly backs this Bulgarian band's abilities. They want to give us everything, so for this sophomore experience Fab and family hope that their listeners savor the tale, and not become too cold or indifferent. 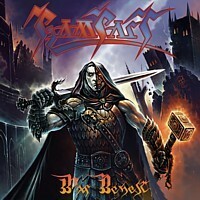 RAMPART draw their influences from Traditional and European based Power Metal Acts like HELLOWEEN whom they cover on the “Hello-Ray Tribute” and re-release of a “A Tale To Cold” (EP). I also detect a hint of QUEENSRYCHE and Geoff Tate's empirical style. Female fronted acts who have a similar style include EVAREST, BATTLE BEAST, or DAWN OF DESTINY. The battle beastly bite of “Thunder Realm”, an acoustic guitar intro sets the pace for “Army Of The Perfect”. Here RAMPART wield their weapons of power, playing fast-paced guitar frenetic and intense riffs. Vili Neshev hones his axe hewing an edifice of accuracy and belligerence.“Ghost Of Freedom” - like the song of the same name found on the new REBELLION release - maintains the mayhem, keeping your head hammering until the middle piece breathes, then reverberates. “Within The Silence” screams with an increased ambiance, for being a power ballad. The hearth heats up with “Fire Circle”, which features some string arrangements, and wayward fashioned anthems, showcasing their acumen of strong songwriting, and keen declarations of indifference. “Storm Force” fulminates with a quixotic cadence, while “Give Nothing Back” suggest that RAMPART may have more up their sleeves than an initial listen might suggest. Honestly, I am not a fan of Maria D.S. 's vocal style. This may leave some readers up in arms, but I listen to a great deal of female fronted acts, and her approach seems forced. She has really beautiful, long hair, and wears her metal heart on her sleeve. However her vocal affectations do not feel authentic. Her tone does not fit with the sound the musicians are attempting to manifest. Perhaps if she just growled a bit like Sabina Classen of HOLY MOSES it might work more to her benefit. I still feel that RAMPART could work more on their grasp of the English language, if they choose not to sing in their native tongue. Overall,I acknowledge that RAMPART try hard and strive to remain true as steel. Evidently Maria and her band mates have created some quality tunes. Give them a chance to put you under their metal spell.